The popular prayer site Sacred Space is a joint apostolate of the Irish Jesuits and Loyola Press. 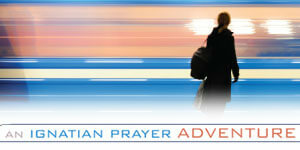 We publish the Sacred Space books for Advent and Lent, and a Sacred Space prayer book for the year. This year, we compiled Sacred Space materials that focus on the topic of encouragement, and the result is Sacred Space: A Little Book of Encouragement. For your encouragement today, enjoy this sample. We know little about Susanna and Joanna other than that they were happy to follow Jesus and were recognized by Luke as disciples. Just think of all those “quiet” disciples whose lives and prayers have contributed to the church but who have left little evident legacy. Who do I know who’s living a quiet but influential life? And do I ever feel that my own efforts are overlooked or insignificant? God, for all—especially women—who support others through their presence, help them draw encouragement from knowing that Jesus sees, recognizes, and loves their passionate service. I include myself in this prayer today, because sometimes I feel invisible and unimportant. I, too think you would be a wonderful Spiritual director, VInita. I especially seek out your posts. I was a fan of DDF once I came across it by chance. You have such a way with words and I know you speak from the heart. Thank you. I have followed you from the beginning. I dream one day of meeting you and taking part in an Ignation retreat. I am humbled by what you have written. I’m in a program now to earn a certificate in spiritual direction. I hope to be doing that in another year or two! Vinita, you who give so much of yourself to others, especially with your thoughtful, insightful reflections, to feel insignificant,. ; that makes me feel really depressed. I try hard but sometimes feel I am not on the right track and in need of spiritual direction, instead of trying to be one. God bless you and your work. A.M.D.G. Dear Vinita, if you feel insignificant, what must a lot of us feel. You have given so much encouragement to others ;with your beautiful writings??. Thank you so much. Also to Annette, I hope you are letting your crises _JUST let it go! Many people know of your worth. Pray for the others, they need it! I may feel invisible and unimportant but I am awareof the Mercy of Jesus and I pray for it every day, for I am a sinner, like the rest of us. What a gift you are, Vinita. I am going through a mini-crisis at this time, and feeling insignificant because of it. Your words and a conversation with my daughter-in-law today have pulled me back into focus. Thank you for the challenge to my status quo. A. Thank the Holy Spirit for bringing all these influences together for you! Thank you, Vinita. Your writings are always spot on for me! Thank you. It was what I needed to read. God’s timing is, as always, perfect. And you are a Blessing. We walk by faith! May thisr reflection touch the soul and heart of someone who is in need. A beautiful little nugget of encouragement – thank you! Thank you for this beautiful multifaceted reflection about the “quiet” and “invisible” disciples – especially women – among us. They and – you – are a reflection of the true fullness and inspiration of the Holy Spirit. Thank you.